This is a refreshing drink which you can take at any time of the week. 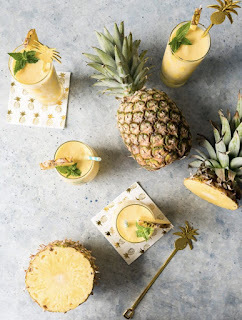 It is a perfect blend of pineapple, apple and orange juice. You can take out the alcohol for a mocktail or add more to make it stronger, depending on your taste. Pour the pineapple juice, apple juice, orange juice and lemon juice into a mixing bowl or pitcher. Chill in a refrigerator until ready to serve. When ready, put ice in two glasses. Pour the mixture over the ice in the glasses. Before serving, divide the rum, if using, between the glasses and stir properly to mix.